Increased vascular permeability and vasodilation are mediated by inflammatory mediators like histamine released by inflammatory cells in response to PAMPs expressed by pathogens. Hemoconcentration (owing to increased vascular permeability) and decreased velocity of blood flow (owing to vasodilation) leads to peripheral pooling of the leukocytes (i.e. towards the endothelium) – process called as margination. Rolling occurs below the critical velocity (velocity separating freely flowing cells like RBCs and rolling leukocytes). It is mediated by selectin-addressins interaction. P-selectins are expressed on the endothelial surface. Remember P-selectins are found on Platelets and webel-Pallade bodies present on human endothelium. P-selectins are the largest and most important of all selectins. Tight binding of phagocytes to the endothelial cell. Integrins – IgCAMs (Immunoglobulin superfamily Cellular Adhesion Molecules) mediated. The phagocytes extends pseudopodia through the vessel wall and extravasates into the tissues. These are autosomal recessive diseases. Failure to express CD 18, which composes common β2 subunit of LFA-1 family (β2 integrins) – interaction with ICAM and VCAM on endothelium is impaired. Diagnosed by evaluating expression (or lack) of CD 18 by flow cytometry. Defective granulocyte migration to infection site – absence of abscess or pus. 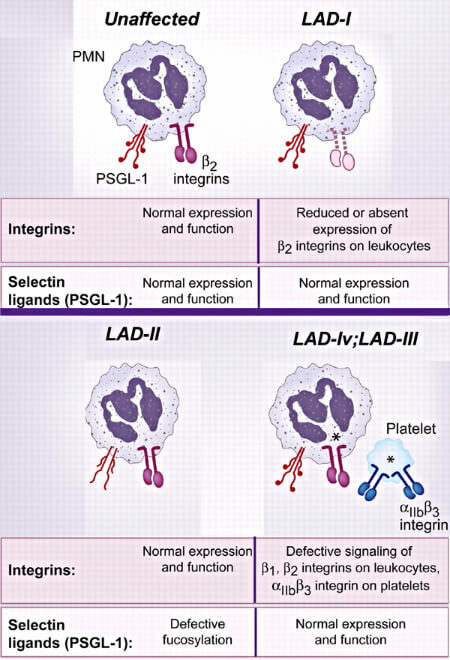 Defective fucosylation of PSGL-1 (selectin ligand) – impaired interaction with endothelial E- and P- selectins. Usually the first signs occur in infancy or early childhood. Patients present LAD-I life-threatening infections and a Glanzmann thrombasthenia-like bleeding disorder. Next Next post: Why to not defibrillate Asystole ? Epomedicine is a source of concise notes on medical topics with relevant details and mnemonics which makes them easy to conceptualize. Learning is not memorizing but conceptualizing.Epomedicine also provides quick access to case discussion on interesting medical cases, videos for developing correct clinical skills and a blog to go beyond notes and research articles to explore the inner-self of medical students and healthcare professionals.